Dennis and SISIS to sponsor US Bowls Championships 2016. Having first took place in 1957; the US National Bowls Championships has a long-standing history and is widely recognised as the premier bowls event exclusively for U.S. lawn bowlers. The event consists of four distinct tournaments: Singles and Pairs for women and men. To play in the Championships, competitors must win one of eight regional qualifiers in the division of their home club. This requirement ensures that all divisions of the United States are represented and it is safe to say that the Championships sees America’s finest bowlers all vying for the ultimate accolade. 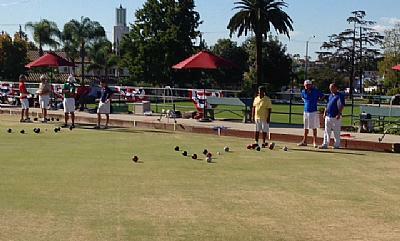 The British manufacturers have been a long-term supporter of the sport of bowls, frequently hosting bowling-green maintenance seminars, and proudly sponsored the 2015 Championships which was held in Long Beach, California. With an extensive range of equipment designed specifically for bowling green maintenance, Dennis and SISIS products are the preferred choice for greenkeepers all over the world, and the greens at this years’ Championships, have been prepared and maintained by two of two of their products. Johnson Lawn Bowls Club is a proud owner of two interchangeable cassette mowers in the FT range – the FT510 and the FT610, as well as the SISIS Auto Rotorake MK5 self-propelled heavy duty scarifier. Both machines play a significant role in keeping the greens to an exceptional standard – worthy enough of being selected as the 2016 venue to host the Championships. The FT range of cylinder mowers is available in cutting widths of 430mm (17"), 510mm (20") and 610mm (24"). With the innovative interchangeable cassette system featuring a range of 11 different cassettes, as well as 5 or 10 bladed cutting cylinders, the FT can be used for several key maintenance tasks including scarifying, spiking, verticutting or brushing. The SISIS Auto Rotorake Mk. 5 is a powerful self-propelled heavy duty scarifier and de-thatcher designed for the removal and control of thatch on fine turf. It is ideally suited to a range of applications from sports field maintenance to synthetic turf maintenance, lawns and amenities and features a number of benefits including a contra-rotating reel with specially designed tipped blades for a clean, consistent cut and maximum thatch removal; alternative blades for light scarifying; depth of cut adjustment control is mounted on the handle to enable depth to be set whilst moving forwards; user-friendly, operator presence controls designed for maximum operator safety; and an easy-fit collector box.